Fortunately or unfortunately, whichever way you want to see it, this left hip will most likely end up to be ceramic or metal within the next year (hopefully March-ish) but we will see how things shake down. I had my appointment with a new orthopaedic surgeon this past week and after examining me, watching me walk, listening to my history and pain levels the surgeon said that when he sees patients present as I do, that they have always ended up with a THR. The radiographs have slight joint space narrowing (not significant, nor has it changed since December), so he has ordered an MRI/arthrogram to determine the extent of cartilage damage and to see how long I can delay having to have it done. We may do an exam under anesthesia as well, if the cartilage looks good, just to ensure that it isn't the muscles that are causing my issues (I am guarding so much due to pain that the full ROM cannot be tested in the office). My only other option would be a periacetabular osteotomy as I lack any form of anterior hip socket (meaning very severe anterior congenital hip dysplasia). But my cartilage would have to be good enough for that, and even then it doesn't guarantee a success. My right side is just as dysplastic as the left, so that hip won't last me either (although it is less symptomatic than my left and I am not sorting out this hip until the left is organized). After much discussion, we were both disappointed that the dysplasia was not identified as a problem with any of my previous surgeons, as I could have avoided several unnecessary scopes, had a PAO, and possibly avoided or delayed a THR. I feel almost relieved, because I have made up my mind and will be perusing a THR at the end of medical school. 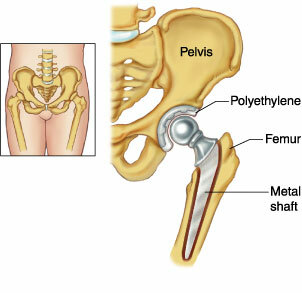 I have done my fair share of hip preservation and I can't go through such a large surgery like a PAO with even the slightest chance of failure (I already know I have grade II arthritis from previous operative reports). So, regardless of the MRI/arthrogram results, I will be doing the full replacement, but the results may dictate how long I can put this off. The surgeon feels that I need to consider taking time off from school, again, to have this fixed because I am, "...so young, not even thirty!" And, "...we are talking about your health here, and we can't mess around with this because you need to be able to live your life." Both of these statements are absolutely true, but there is no way that I can mentally or physically handle another surgery in the very near future (as the surgeon is eluding to wanting to do). I need some time to try to recover from my previous surgeries. I realize I am exhausted from the constant throbbing, but I just don't think that I can do another surgery for a couple more months. I feel that if I save up my vacation I can use it all at the end and finish school early and have the replacement on the left side. I thought that he would be pushing for me to do a PAO or something, but he was adamant about the fact that a THR will most likely be my best bet. And even if the MRI/arthrogram comes back with small amounts of arthritis, he wouldn't blame me one bit for still going through with a THR. Enough is enough and I need my life back. Living like this is in no way, shape, or form tolerable or desired. Life is too short. I will be willing to curtail my activities in order to allow my replacement to last as long as possible. I haven't been able to do anything physical for the last 7 years, and to just get the chronic pain relief will be more than welcomed. Vicky, surprised that the previous surgeons didn't identify the dysplasia. But glad to see there is a diagnosis and you'll be painfree when you get the THR. I've known many who have had THR, granted their much older, but nonetheless, all of them have been happy with it. Just wanted to add that I would agree with the surgeon that you have to live your life. You've already been through a lot. Sorry none of this stuff has worked. This may seem like a crapshoot...what isn't? Anyways, there is a guy in Miami who injects IAGH into the joint. IAGH = intra-articular growth hormone. Apparently does it for hip impingement. Anyways, maybe some of this regeno-stuff (PRP, stem cells, HGH) could help out your situation with minimal invasiveness. It'd be a shame to throw away a good femoral head surface for nothing...but it seems your labrum rim is absolutely shot? And you have "weird-shaped hip sockets"? Anyways, best of luck. Stink-o you've gone through so much. Anyways, I have hip impingement (basically feels like someone is "pinching" me in the groin but it hasn't progressed to the point of full-blown "I can't walk" or "even run" just feel like someone is pinching my groin when I sit or sleep. Anyways, I think I am going to be conservative.